Home › Latest News › Introducing Cameron Massie, our Customisation Consultant! Introducing Cameron Massie, our Customisation Consultant! 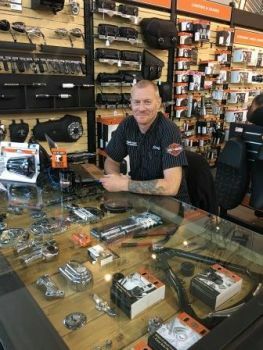 Meet Cameron Massie, he's the resident CSM at Sunshine Coast Harley-Davidson®. Working with us for almost 1 year now, Cameron's passion for Harley® started when he was just a boy and has been working with Harley® motorcycles since as long as he can remember. "To me there is no better feeling than hitting the road and riding regardless of the destination." Cameron currently owns a 2016 Breakout® which as you can imagine has his own personal custom touch, including Stage One with a Screamin’ Eagle Heavy Breather, Screamin’ Eagle Super Tuner Pro, Magnaflow Riot 2 into 1 exhaust, 16” Burleigh Highballs extended forward controls and so much more! If you want to add to your ride, turning it into something truly personal, then Cameron is the man to see! With so many years of Harley® experience under his belt, Cameron has the knowledge and passion to help you as a customer get the most out of your ride.